Reality Star Photos: Carole Radziwill, Bethenny Frankel, Farrah Abraham, Tom Sandoval and Many More! Happy Tuesday! We have an all-new group of reality star photos to share with you this afternoon! The caption on this photo was just so good that I had to include it here. 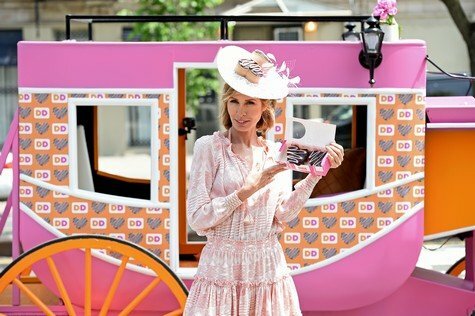 “Real Life Princess, Carole Radziwill Takes The First Ride In Dunkin Donuts Royal Carriage In Celebration Of The New Royal Love Donut In New York City on May 14, 2018 in New York City.” How lucky is RHONY to have a “real life princess”? Tom Sandoval and Ariana Madix enjoyed a little date night out at the KROQ Weenie Roast 2018 in Carson, California. Real Housewives of Atlanta star Kandi Burruss attended Exhibit Gray in Atlanta while her new reality TV cohort Marlo Hampton was seen at a Prom Giveaway at W Hotel Atlanta Midtown, as well as attending the Tammy Rivera EP Release Party for “FATE” at Dazzle Me Parties. Little Women: LA star Terra Jole attended 4th Annual RuPaul’s DragCon at Los Angeles Convention Center. Dance Moms star Mackenzie Ziegler celebrated her new book, “Kenzie’s Rules for Life” at Barnes & Noble at The Grove. Earlier this month Jax Taylor and Brittany Cartwright spent some time with Brittany’s mom Sherri at the Kentucky Derby events. Beverly Hills Housewife Lisa Rinna hung out with daughter Amelia Hamlin at a Mother’s Day event in L.A. Check out these and many other reality star photos below!